Ahh, Spring! A time of rejuvenation and rebirth, the first season of the Stardew Valley year is when and where you’ll begin it all. Spring is the time in which you’ll come to know the intricacies of the Valley - and experience some of the initial struggles of starting up your new farm. Spring is the ‘greenest’ part of the year. The Winter snows recede completely, revealing a lush, fertile world full of stuff to do. The first few days of Spring will typically be spent cleaning up your property, as freshly-grown grass and rocks tend to appear all over your property. It’s also the beginning of planting for the year, and you’ll probably have to re-hoe your fields after their stagnation in Winter. 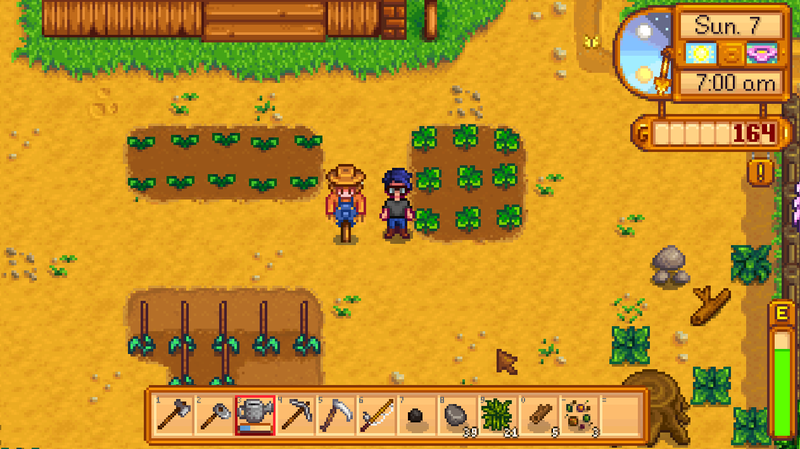 You will begin each new game of Stardew Valley in Spring, and for the first week or so many aspects of the game - farming, fishing, entering the Mines, the Community Center, etc. - will gradually be unlocked. As such, Spring starts out as a tutorial of sorts for Stardew Valley. On the first day of your second year Kent will arrive in Stardew Valley and introduce himself. Spring offers a wide variety of unique crops for farming each year. The ‘basic’ crop is the Parsnip, costing little and growing quickly, though you can make money with Potatoes, Tulips, Kale, Blue Jazz, Cauliflower, Green Beans, and Rhubarb as well. You can also make some excellent recurring profits off of Strawberries, though you can only purchase Strawberries during the Egg Festival, limiting their usefulness during your first year. During your second year you’ll be able to purchase Garlic at Pierre’s General Store as well as the above Seeds. Spring is also a fruitful time for foraging, and you can pick up Daffodils, Leeks, Wild Horseradish, Dandelions, Common Mushrooms, Morels, Spring Onions, and Salmonberries while exploring or digging in the dirt. The Egg Festival is on the 13th of Spring. Your goal during the Egg Festival is to try and find as many hidden eggs as possible during a timed Egg Hunt. The winner receives a prize. The Flower Festival is on the 24th of Spring. 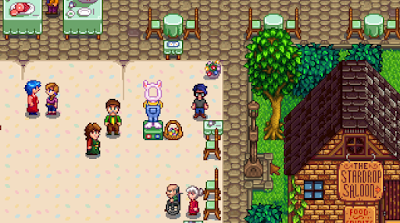 Aside from a few purchases unique to this day, the Festival serves as a test of your affection level with the bachelors and bachelorettes of Stardew Valley. ‘Spring Cleaning’ applies here, as your fields will be a mess during your first year and after Winter on your second year. Check the grounds over and clear away any debris early. Spring seems to have the greatest chance of rain out of the four seasons. Take advantage of this by establishing other pursuits on rainy days nice and early in your career as your farmer, as the rain will often take care of watering your crops for you. Grass grows quite liberally in Spring. If you have lots of farm animals you can simply release them and let them clear it for you - though you should probably pen in the grass, if possible, as your animals will start roaming all over your property otherwise. Because they can potentially yield up multiple ‘taters in a single harvest, I’ve found Potatoes to be some of the best crops to plant during Spring. Sprinkle liberal amounts of Fertilizer to maximize the number of Potatoes you’ll get from each plant. Check your Community Center Bundles each season, and try to get any Spring-centric Bundles out of the way as early as possible. Watch your timing! Though the crops of Spring grow more quickly than other seasons on average, it's still quite possible to accidentally plant your Seeds too late. Plants that carry over between seasons - in this case, between Spring and Summer - will virtually always wither and die. You may learn this lesson the hard way during your first Spring.